RocketTheme have released version four of the extremely popular Versatility theme and it's just gotten bigger and bigger. The thing with the Versatility range is and it's in the name, versatile and every time a new one has cone out it's just gotten better, faster and packed more with features. This time it is no different. The theme comes with 10 pre-included styles, 45 module positions, up to seven layout columns, loads of banner and block advertising space and four menu styles. Loads of stuff and well worth a look. 1.0 & 1.5 Native RocketLauncher now available! 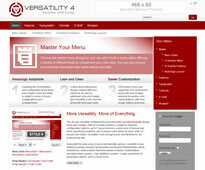 - Deploy a replica of the Versatility 4 demo sites.